Intel 6-core i7 based high performance multi-display video server with 8GB RAM and 4GB graphics memory, high end graphics adapter with 4 (Quad) DVI display outputs, 1 outputs for control and editing screens, 2x DVI and 2xHD-SDI inputs for video grabbing, System on SSD with 120GB, Data Storage / SSD with 480GB RAID, 8.9″ Touch-Display, 19″ Case 5U professional shock proofed housing / depth 673mm, Warranty 1 Year, including Wings Vioso licenses, Wings Touch and AVIO Manager. 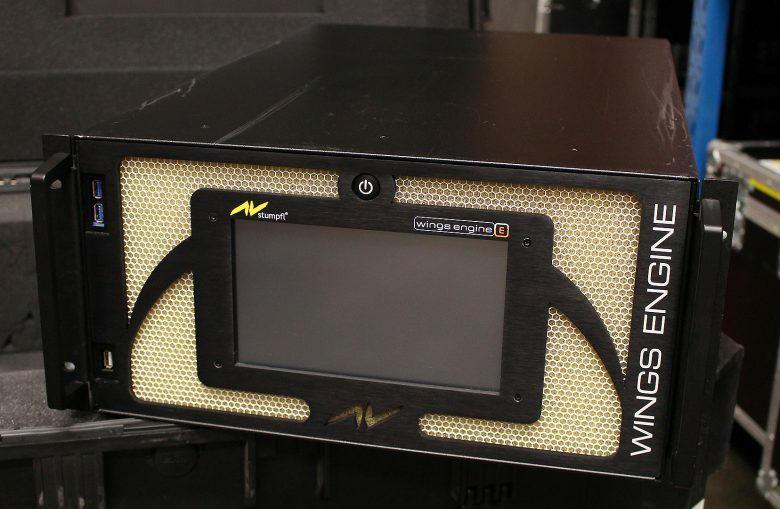 Wings Engine Stage is the technologically most advanced Media Server system featuring a solid hardware platform, automatic camera based softedge and warping calibration, DVI/3G-SDI Live inputs, virtually no resolution and content limitations and sophisticated show and interactive control capabilities. Did you ever try to use regular computers in a rough staging environment? We do know well about the requirements of the rental & staging industry. Combined with our over 40 years of experience in developing and manufacturing first class projection screens this results in an ingenious case design. The outer case is made of high-strength stainless steel and holds an inner case made of aluminum alloy on shock absorbing anti vibration rubber buffers. 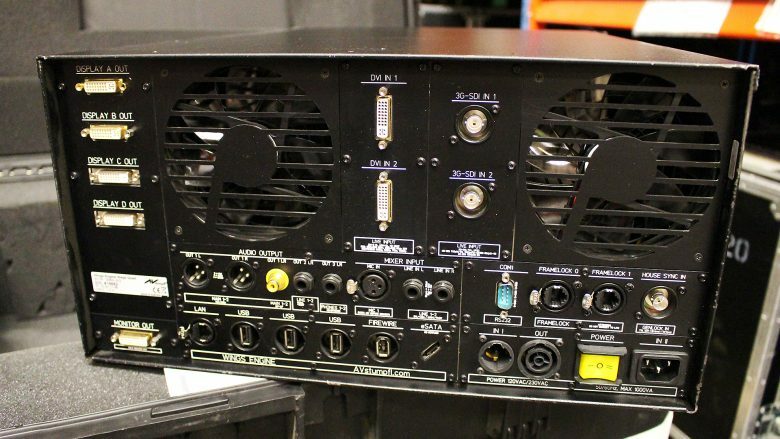 All connections between the electronics compartment and the Neutrik plugs on the outer case are secured and maintenance free. Multi Channel 4K. 8K and beyond. Uncompressed Playback. Live Rendering. All components of our Wings Engine Stage media server have been selected according to the following criteria: Uncomprisingly performing and robust. The resulting capabilities are ranging from multi HD stream playback up to playback of picture sequences – so called uncompressed playback. Up to 4 DVI or 3G-SDI inputs feed live signals from cameras, computers or other signals into the media server. These live signals can be used together with contents from the SSD Raid system either as part of preprogrammed timelines or controlled live in real time. Wings Engine Stage is available with 2 or 4 DVI outputs to feed projectors or displays with signals. All outputs are frame locked and can be synchronized to a house clock to prevent tearing and jerking when using multiple projectors and/or displays and cameras in the same setup. Our Wings AV OS is an embedded operating system based on Windows® 7. We have replaced the standard Windows Shell/Desktop with our own user interface which gives quick and easy access to the server’s Wings AV software, system configuration, as well as maintenance and support tools such as our proprietary EDID Manager or our Backup & Restore Manager. The core of the Wings Engine Stage Media Server system is the Wings AV software suite which drives live events as well as interactive installations. The software suite is capable of doing timeline content production, camera based automatic projector calibration with softedge and warping, cue based live playback, intuitive drag & drop show control programming and customized touch interface creation.